Someone has adapted an industrial robot to allow it to be controlled using the remote controller that ships with Nintendo's Wii games console. A neat example of Wii Remote hackery, to be sure, but what'll happen when the robot gets to hold its own controller? 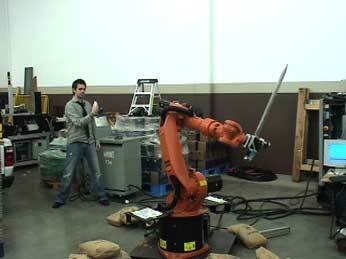 The guys at the USB Mechatronics website used the robot, a Kuka KR16, to wield a sword, linking the mechanical arm to a laptop capable of reading the signals sent out by the Wii Remote. Software running on the notebook converts the input to KR16 control codes, effectively duplicating the Remote's movements as robotic sword thrusts, strokes and parries. 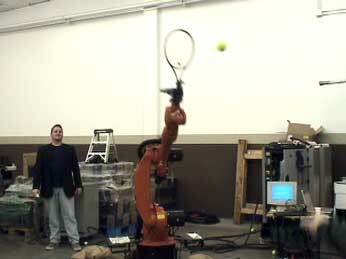 The team also got the robot swinging a tennis racket.